In coordination with a statewide soybean disease survey, soil samples were collected from soybean fields from 17 counties throughout New York beginning in 2013 to search for the presence of the soybean cyst nematode (SCN) (Fig 1). Surveys were enabled with support of the Northern New York Agricultural Development Program, the New York State Corn and Soybean Growers Association Soybean Check-off Program, and USDA-NIFA Hatch and Smith Lever funds. After four years of intensely surveying field soils from western through northern NY counties, the nematode has now been identified and confirmed in Cayuga County. The survey was coordinated by Cornell University’s Field Crops Pathology program under the direction of Dr. Gary Bergstrom and Research Support Specialist Jaime Cummings in collaboration with numerous Cornell Cooperative Extension Educators and countless soybean growers throughout the state. Nematode extraction and initial identification was performed in Dr. Xiaohong Wang’s USDA ARS nematology lab at Cornell. Confirmation of the nematode’s identity as Heterodera glycines was made via microscopic examination by Dr. Zafar Handoo and via DNA sequence analysis by Dr. Andrea Skantar, both of the USDA-ARS in Beltsville, MD. The soybean cyst nematode is considered the single largest cause of soybean yield losses nationwide and its occurrence has been confirmed in much of central and eastern North America (Fig. 2). Identifying and diagnosing SCN damage can be challenging, because aboveground symptoms, including stunting and chlorosis, may be vague and also caused by other abiotic stresses. Belowground symptoms include discoloration or necrosis of roots and reduced nodulation. 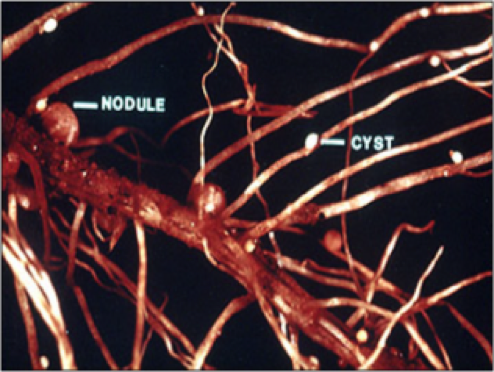 The female nematodes may be visible on roots as very small white or yellow lemon-shaped cysts, and are easily distinguishable from nodules (Fig. 3). This pest was expected to be found at some point in New York soils, as it has been documented in areas of Canada adjacent to Niagara, St. Lawrence, Franklin, and Clinton Counties. However, low levels of the pest can be difficult to identify in soil samples, and may require multiple years of sampling before the pest population reaches a detectable level. Figure 2. 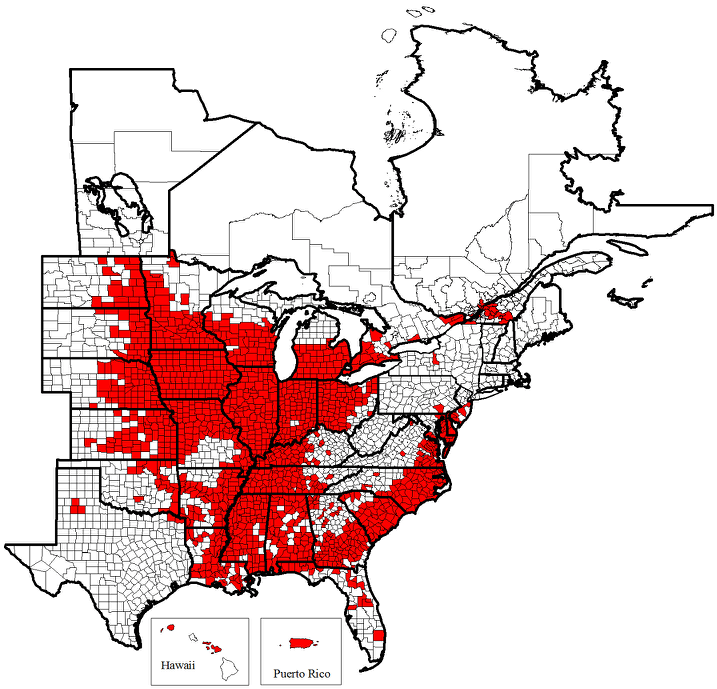 Counties (in red) in the US and Canada where soybean cyst nematode has been confirmed to occur as of March 2017. This figure is provided courtesy of C.C. Marett and G.L. Tylka of Iowa State University. Figure 3. SCN cysts and nodules on soybean roots (photo courtesy of the University of Missouri). We should be vigilant in our continued search for the likely more widespread distribution of this potentially devastating pest throughout NY. Systematic research survey efforts through CCE collaborators will continue in 2017. Soil sampling for SCN analysis is recommended for growers who suspect infestation, and this service is available through the Plant Disease Diagnostic Clinic at Cornell University and other state and commercial laboratories (Fig. 4). Because the nematodes are very persistent in the soil, and have a complicated race structure, an integrated management approach is recommended. Management practices include crop rotation, planting race-specific, resistant varieties, nematicidal seed treatments, and cultural practices that reduce plant stress and optimize plant health and yield. Figure 4. 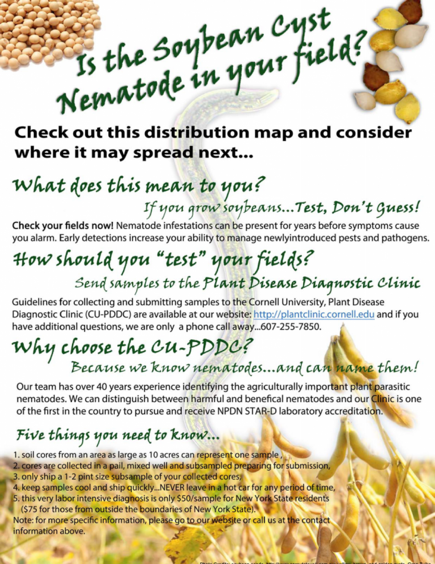 Information on submitting soil samples to Cornell University’s Plant Disease Diagnostic Clinic found on the SCN page of the soybean disease survey portion of fieldcrops.org. The results of this ongoing survey are now available in the soybean disease section of Cornell’s fieldcrops.org extension website https://fieldcrops.cals.cornell.edu/soybeans/diseases-soybeans/soybean-disease-survey. The website, updated annually, outlines the progress of the survey and the counties included in the survey. New York soybean growers can use this new tool to find information on which diseases/pests have been identified in their respective counties, along with information on each disease including epidemiology, diagnostic characteristics for in-field identification, and management options and recommendations. Deep soil layers can be a significant sink of soil organic carbon and an important source of soil moisture and nutrients for crop growth. Distinct soil microbial communities may also be present in subsoil layers compared to topsoil due to nutrient dynamics, soil physical properties and drainage. In addition, the ‘transition layer’ between topsoil and subsoil layers may form a plow pan, resulting in compaction, and restricted root growth. With concerns about crop production under changing climate and weather patterns, we need to better understand how soil management practices impact these deeper soil layers. Traditional soil testing on grower fields has been limited to topsoil nutrients (typically 0-6 inches in depth). Shallow soil sampling has been justified due to the challenges of sampling to deeper depths and also the relative importance of topsoil when adequate growing conditions are met. More recently, the Comprehensive Assessment of Soil Health approach, which includes analysis of soil physical, biological and chemical properties, has gained acceptance in providing information on crop growth constraints, but these assessments have also only been applied to surface soil layers. The objective of this study was to investigate the impacts of crop and soil management on soil health conditions throughout the entire soil profile. The soil health impacts of 40-year long continuous corn cropping under two tillage systems (plow-till vs. no-till) crossed with two residue management practices (removed vs. returned) were assessed at different soil depths. (0-to-24 inches; Fig. 1). 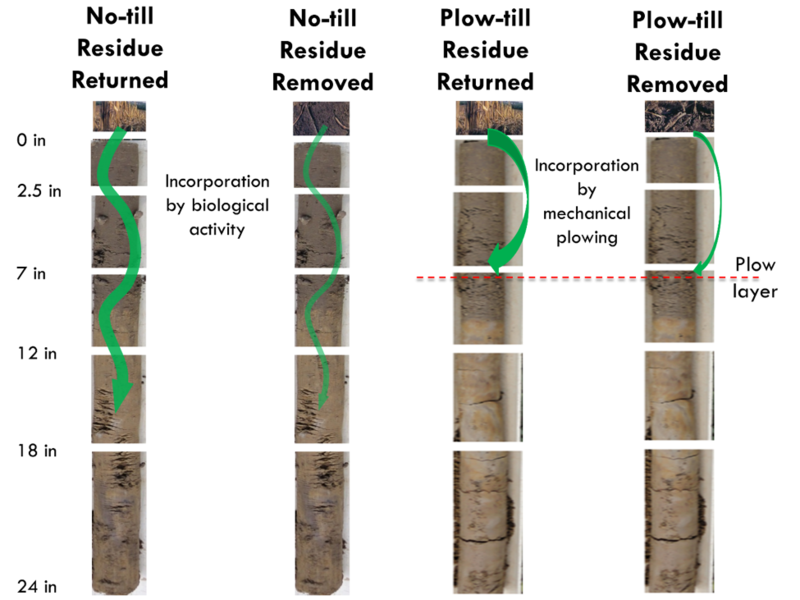 The unique history of this experiment – conducted at the Miner Institute near Chazy, NY with four replications for each treatment — allowed us to look at the long term effects from reduced tillage, which generally improves soil aggregation, enhances soil biota, and changes rooting patterns. It also allowed us to evaluate whether reduced tillage has more or less benefits than returning corn stover as residue, which feeds the soil microbiota and provides macro-nutrients like potassium. 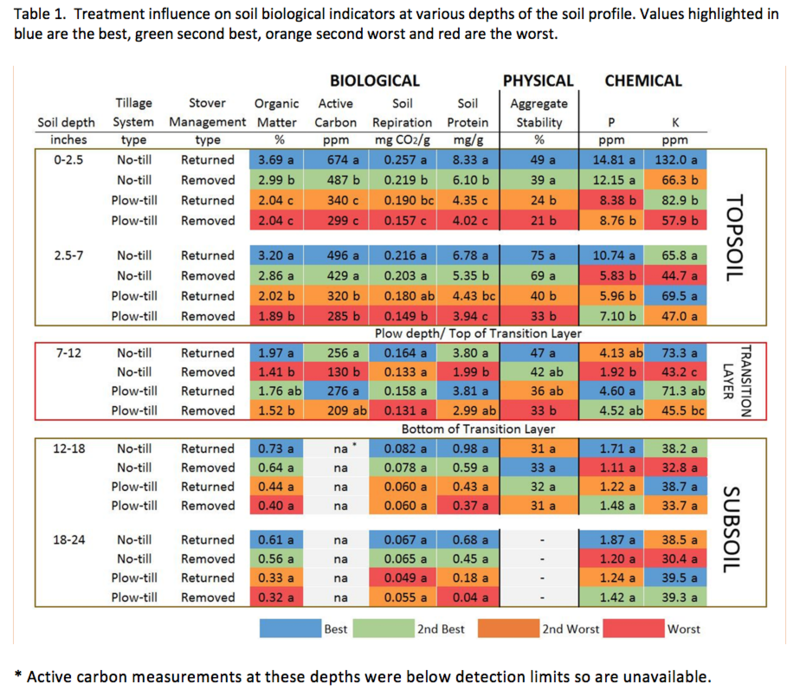 Using the Cornell Comprehensive Assessment of Soil Health (http://soilhealth.cals.cornell.edu/) approach, we analyzed aggregate stability in addition to the soil biological indicators of soil organic matter, active carbon, soil respiration and protein. The chemical indicators phosphorus (P) and potassium (K) were also analyzed. Table 1 shows mean values measured for each treatment in various soil layers. We used a color scheme to help interpret the numbers from best to worst (blue-green-orange-red). For biological and physical indicators the order of the measured indicators was generally: No-till-Residue Returned > No-till-Residue Removed > Plow-till-Residue Returned > Plow-till-Residue Removed. The pattern was consistent, although the effects were statistically significant only in the topsoil layer. This shows that eliminating tillage had greater benefits for soil health throughout the soil profile than returning residue, though stover return was shown to be important in avoiding the depletion of macro- and micro- nutrients, especially potassium, under No-till below the surface layer. Finally, we found unique soil conditions in the transition layer (7-to-12 inch depth, Table 1) where the relative benefits from the treatments were different from the other layers, because the surface residue is placed at this depth under Plow-till. This seems to benefit the transition layer only and not the layers above or below. In deeper soil layers, Plow-till had lower soil organic matter content and related soil physical, biological and chemical properties due to a lack of transfer from the topsoil to subsoil layers. These are interesting results as they show that No-till benefits soil health not only in the surface layer but also deeper into the soil, especially when corn stover is left in the field. Conversely, Plow-till places organic residues at the bottom of the plow layer (transition layer), but does not show benefits in other layers. Why is this the case? We hypothesize that the main benefits come from greater and deeper biological activity under No-till, especially when residue is left in the field (Fig. 1). We now have a better understanding of how critical decreasing soil disturbance through reduced tillage enhances biological activity, which may extend deep into the soil with worm species like night crawlers. They transport organic material from the surface deep down into the profile. The continuous deep soil pores may also transport dissolved organic carbon deeper into the soil with percolating water. We also generally see more vertical and deeper roots with No-till, which additionally helps transfer organic material down to deeper layers. Figure 1. Experimental design. A transition layer between the topsoil and subsoil can potentially form a plow pan and lead to compaction resulting in restricted root growth. In contrast, the absence of the plow pan may facilitate the transport of organic material from the surface deeper into the profile. This study found that combinations of tillage and residue management affect soil health at different depths, which can in turn affect the overall availability and accessibility of soil moisture and nutrients from the soil system. The direct impacts of tillage and residue management occur mostly near the soil surface, but also have effects on soil properties deep in the profile, where no-tillage and residue return positively influence subsoil conditions. The long term yields from these plots have followed the same pattern as the soil health measurements, where plots with no-tillage and residue return out yield those with plowing and residue removal. This article is based on a paper titled “Quantitative soil profile-scale assessment of the sustainability of long-term maize residue and tillage management” (Kinoshita et al., 2017; accepted in Soil and Tillage Research). This work was supported by grants from the Northern New York Agricultural Development Program. 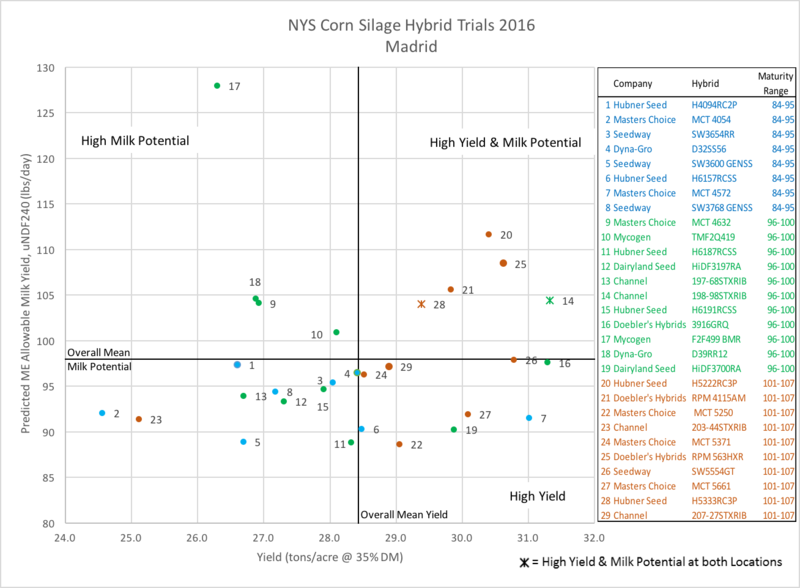 A number of independent Corn Silage Hybrid Testing Programs, including the New York (NY) Corn Silage Hybrid Trials, offer valuable information on hybrid performance. But what if the hybrids you’re looking at are not found in individual trials? Hybrids in the trials are a subset, and on the surface may seem limited in their usefulness. However, the results can offer a wealth of information beyond the ranking of participating hybrids. In fact, just looking at the top performing hybrids from a single year, while interesting, has limited value. Trial data for an individual hybrid is most useful with multiple locations and multiple years to understand how the hybrid performs across a wide range of conditions. This level of data can be hard to come by in the independent trials but may be available from seed companies. the expected range in results for important values, such as starch content and fiber digestibility. With this information, you are equipped to ask individual companies for data on these important characteristics and values in their hybrids. While the specific hybrid may not be in the trial, a company should have information on other hybrids that share the same lineage or have similar performance to a hybrid that exhibited desirable characteristics in the trials. The mean for a location is the average value of the measured parameter (yield or % starch). Since several localized factors, such as weather and soil type, influence the performance of the hybrids at a particular location, studying the absolute values (yield per acre, % starch or fiber digestibility) is not suggested. It is much more helpful to study the trial mean and compare hybrid performance relative to this mean to gain a better understanding of how it performed under the conditions at that location. In any testing program, the goal is to harvest all hybrids as close to the same stage of maturity (whole plant DM) as possible. In practice it is recognized that there will be variation in DM at harvest. Yields are corrected to a uniform DM for reporting. They are generally reported at 35% DM. However, it is also important to acknowledge the effect of DM on forage quality. It is recommended to only compare the forage quality results of hybrids that are within three percentage points of DM to each other. When data for multiple locations within the same trial are available or data on the same hybrids grown under slightly different management in other testing programs are available, it can be very useful to understand the effects that weather patterns, planting dates, seeding rates and other differences can have on the hybrid. This insight helps to address questions regarding the ability of a hybrid to perform consistently across conditions or if there are specific conditions where it performs best that match the conditions typical of your farm. Again, utilizing company data in conjunction with other trials can be very powerful for this. It is also important to note that differences in growing conditions does not just impact yield, it can have large impacts on forage quality. While we commonly look at important factors such as whole plant dry matter and starch content, the effect of growing conditions on fiber digestibility was very apparent. In recent years several advances in ruminant nutrition have increased our understanding of fiber digestibility, how this drives how much a cow will eat and the implications on her potential to produce milk. The measurement of undigested neutral detergent fiber (uNDF) is being reported by more hybrid testing programs and was an integral piece of data in the new approach to predicting potential milk yields in the NY Corn Silage Testing Program. Starting in 2016, the NY trials used new methods to evaluate the milk producing potential of corn silage. The Cornell Net Carbohydrate & Protein System (CNCPS) model was used to predict the expected milk yield (in pounds per day) of a typical, Northeastern high lactating ration with each of the participating corn hybrids entered into the same total ration. Again, the relative ranking of the hybrids is more useful than the absolute values, but this approach uses a much more in depth analysis to assess how each hybrid may perform in an actual ration compared to previous approaches. It is evident in the report how the uNDF content of each hybrid may affect the potential dry matter intake of the ration and the subsequent effect on projected milk yield. Starch content is a popular number to look at and justifiably so. At the risk of excessive repetition, this is another case where it is critical to look at these values in the context of the location mean, rather than absolute values as growing conditions and stage of harvest (whole plant dry matter) can affect this value. Starch digestibility is more challenging. We know this value changes as the silage ferments, and laboratories continue to refine their ability to accurately predict starch digestibility using NIR methods, compared to the more intensive wet chemistry laboratory testing methods. It is also recognized that results from green (unfermented) samples, as are often used in Hybrid Testing Programs, are less consistent. It is generally accepted that a hybrid with good starch digestibility before fermentation will remain incrementally better after fermentation when compared to a hybrid that starts with lower digestibility before fermentation. Inquiring with a company about their data is quite beneficial, especially if they have wet chemistry data on fermented samples. It is always best to compare results from the same laboratory. However, if the results available are from different labs, ask for data from multiple hybrids to establish the relative differences in like datasets. While yield often receives too much attention in silage hybrid selection, you do want strong hybrids that have a competitive yield and are able to handle potential stressors. Some of these stressors may be more broadly driven by weather, while others may be typical of the micro-climate you farm, such as soil drainage, air drainage (disease prevalence) or elevation driven temperature trends. This is another instance where rather than focusing on actual yield numbers, pooling data from multiple locations and sources and matching this with weather data from those locations will help you understand if a hybrid’s performance is consistent across conditions or if it excels and falters in certain situations that may be applicable to your area. In 2016, we were pleased to be able to reinstate the corn silage hybrid testing program at Cornell. The reinstatement of the New York trials was made possible with support from dairy producers, participating seed companies, Cornell University, the New York Farm Viability Institute, and the Cornell University Agricultural Experiment Station. Twenty-nine corn silage hybrids (ranging from 84 day to 107 day relative maturity [RM]) were tested at two locations in NY in 2016. Hybrids were planted at the Musgrave Research Farm in Aurora (Cayuga Co.) and at Greenwood Farms in Madrid (St. Lawrence Co.). Seed companies were invited to submit hybrids for both sites for a fee. The purpose of this trial is to provide unbiased, local data to aid in producers’ decision making and consultants’ recommendations. Detailed results can be found in the full report at (https://scs.cals.cornell.edu/extension-outreach/field-crop-production/variety-trials#corn-silage). Here we will discuss the main points of the 2016 trials. All hybrids were planted at 34,000 plants/acre. The Aurora site was planted on May 12th and the Madrid site was planted on May 17th. Hybrids were planted in a randomized complete block design, with 4 replications, by 5-day maturity groups. The Aurora site was harvested on three dates, according to maturity group. Early (90-95 day) corn was harvested on August 29th, medium (96-100 day) corn was harvested on September 1st, and late (101-105 day) corn was harvested on September 7th. At the Madrid location, all maturity groups were harvested on September 13th. The goal was to harvest all hybrids at about 65% (±3%) moisture. Overall growing degree day accumulation was above average across the state while rainfall was extremely variable. Both locations in this trial were below average in total rainfall (Table 1) but the patterns in the rain events made significant differences in the crop’s performance. A significant change to the program in 2016 was the way in which hybrids were evaluated for forage quality. For each hybrid, the forage analysis results (four replicates) were applied to a typical New York higher corn silage-based diet utilizing the Cornell Net Carbohydrate and Protein System (CNCPS v. 6.5.5; Cornell University, Ithaca, NY) biology and dynamic model and were averaged by site. The diet was developed for a second lactation dairy cow to produce 100 pounds of milk per day with forage at ~60% of diet dry matter (DM) and corn silage ~70% of forage DM in a software platform (NDS Professional version 3.9.2.03, RUM&N Sas, Reggio Emilia, Italy), which utilizes the CNCPS biology. This novel approach to hybrid evaluation allowed us to account for differences in dry matter intake (DMI) potential of the total ration based upon hybrid selection and is a more biologically robust representation compared to evaluating hybrids on a constant DMI basis. The predictions made by the CNCPS biology were used to evaluate differences in intake potential and subsequent metabolizable energy (ME) and metabolizable protein (MP) allowable milk yield based upon the nutrient and digestibility characteristics of each hybrid. Only the ME allowable milk yield is reported as it was more limiting than MP allowable milk yield for all hybrids. A season such as this provides an opportunity to evaluate hybrid performance under variable growing conditions. While more locations are always beneficial, the difference in growing conditions and performance at these two locations provided some valuable insight into hybrid performance. Figures 1 and 2 identify hybrids that performed above average in both crop yield and milk yield (top right quadrant) at each location. The hybrids performing above average at both locations are more likely to maintain a high level of performance across varying growing conditions. Due to very different growing conditions experienced at the two sites, there was a large difference in the undigested neutral detergent fiber (uNDF) overall mean values, which translated into large differences in the predicted milk yield when corrected for uNDF at the 240 hour time point (uNDF240). The predicted ME allowable milk yield on a DMI equivalent was not as variable as the predicted ME allowable milk yield on an uNDF240 equivalent. This would be expected when DMI of the total ration is allowed to vary to meet a constant uNDF240 intake. We also need to acknowledge that while this approach offers a sound method for comparing relative hybrid performance, the absolute differences in predicted milk yield are predicted values from the model and are likely greater than the actual differences in milk yield expected in a herd of cows. Based on the overall mean for predicted milk yield on an uNDF240 equivalent, corn silages performed exceptionally better at the Aurora site than at the Madrid site. However, the overall mean corn silage yield, when adjusted to 65% moisture, was drastically lower at Aurora than at Madrid. Due to higher fiber digestibility content in the hybrids grown at Aurora, it is predicted that dairy cows will consume more feed compared to the feed produced at Madrid, as reflected in the adjusted total mixed ration (TMR) DMI. With lower yields and higher predicted DMI at Aurora, dairy farmers feeding corn silages grown under these environmental conditions are more likely to be constrained by inventory for the following year compared to farmers feeding corn silages grown at Madrid. The locations of our trials underlined the highly variable rainfall patterns experienced across NY state in 2016 and highlighted how critical timing of rainfall can be, rather than solely total rainfall. In general, the eastern part of NY state experienced adequate rainfall with amounts diminishing as you moved west across the state, though there were large variations within regions. Producers in areas with adequate rainfall reported average to well above average yields, while other areas ranged from below average yields to complete crop failure. As was the case at our Aurora location, August rains in some locations helped save the crop from complete failure, though it was clearly still below average. The impact of weather patterns and growing conditions on key factors, notably fiber digestibility and starch, influencing forage quality and milk producing potential on these hybrids was very evident when comparing the differences in crop yield and predicted milk yield across the two trial locations (Figures 1 and 2). Figure 1. Relationship between silage yield and milk production potential at Madrid, NY. Hybrids located in the top right quadrant were above the overall mean for both crop yield and milk production potential and are considered good performers. Hybrids located in the bottom left quadrant were below the mean for yield and milk production potential. Hybrids in the top left quadrant were below the mean for yield and above the mean for milk production potential and hybrids in the bottom right quadrant were above the mean for yield and below the mean for milk production potential. Hybrids that were above average for crop and milk yield at both locations are marked and noted in the legend. Figure 2. 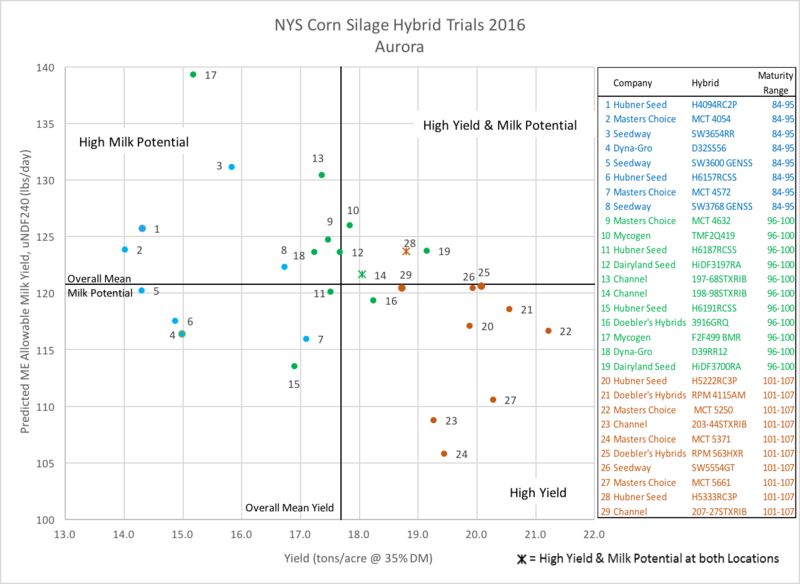 Relationship between silage yield and milk production potential at Aurora, NY. Hybrids located in the top right quadrant were above the overall mean for crop yield and milk production potential and are considered good performers. Hybrids in the bottom left quadrant were below the mean for yield and milk production potential. Hybrids located in the top left quadrant were below the mean for yield and above the mean for milk production potential and hybrids located in the bottom right quadrant were above the mean for yield and below the mean for milk production potential. Hybrids that were above average for crop and milk yield at both locations are marked and noted in the legend. Predicting milk yield with the use of the CNCPS model provides dairy farmers and dairy nutritionists in NY with a more applicable approach for evaluating different corn silage hybrids. The predicted ME allowable milk yield on an uNDF240 equivalent reflects how much DMI the cow might be able to consume based on rumen fill and passage rate. These results demonstrate how crucial it is to adjust rations based on the predicted DMI rather than replacing corn silages on a DM equivalent basis. We thank the seed companies that participated in 2016 for their collaboration. We urge all seed companies to participate in our corn silage testing program in 2017 so we can provide the best information under New York growing conditions to our New York dairy producers. We thank Greenwood Dairy for their ongoing collaboration and support of the program; Paul Stachowski and Jeff Stayton at the Cornell Musgrave Research Farm, Aurora for their efforts during field operations; Greg Godwin, Kitty O’Neill, and Mike Hunter for assistance at harvest and Buzz Burhans and Ermanno Melli for providing us with the NDS software and technical assistance. We appreciate the guidance of Dr. Bill Cox, Dr. Jerry Cherney, Phil Atkins, and Ken Paddock in implementing the 2016 trials. Additional financial support was provided by New York Farm Viability Institute and the Cornell University Agricultural Experiment Station. Triticale planted as a double or cover crop after corn silage harvest in the fall can provide many benefits to forage rotations in the Northeast, including reduced risk of soil erosion over the winter months, enhanced soil organic matter, improved rotation diversity, and, if grown as a double crop, increased total season yields. In addition, triticale has the potential to take up readily available nutrients either left over from the previous crop or from fall-applied manure, reducing the potential for nutrient loss. The benefit of fall nutrient uptake will depend on how early the winter cereals are planted in the fall. To evaluate the impact of planting date and nitrogen (N) availability on the growth and N uptake of triticale, four trials were conducted from 2012-2014. The four trials were planted with triticale (King’s Agri-Seeds Trical 815 variety) from late August to early October in eastern NY (Valatie) and central NY (Varna). Each trial had two planting dates and, to create a range in soil nitrate availability, 5 N rates were applied at planting in the fall (0, 30, 60, 90, and 120 lbs N/acre). Triticale was planted at 1-inch seeding depth and 7.5-inch row spacing (120 lbs/acre seeding rate). In late November prior to frost, we sampled the above ground biomass and analyzed the biomass for carbon and nitrogen. The “Apparent N Recovery (ANR)” was also calculated for each trial to see how efficient the triticale was at recovering fall-applied N. The ANR is calculated by subtracting the total amount of N in the biomass when no N was applied from the amount of N in the biomass when N was applied, and dividing that value by the actual amount of N applied: ANR (%) = (Triticale NN rate – Triticale N0 N)/N rate. A higher ANR means more of the N that was applied was taken up by the triticale. Triticale planted before September 20 had more biomass than plots planted after September 20. For the triticale planted after the 20th, there was no increase in biomass when N was added. However, when triticale was planted earlier, N addition resulted in increased growth (Figure 1a). Across all N rates, biomass ranged from 0.6 to 1.1 tons DM/acre and averaged 0.9 tons DM/acre when planted before September 20, and 0.2 to 0.3 tons DM/acre with an average of 0.2 tons DM/acre when planted after September 20. These results are consistent with earlier studies in New York (see Ort et al., 2013), where triticale planted prior to September 20 yielded, on average, 0.7 tons DM/acre above-ground biomass in the fall, versus 0.2 tons DM/acre with later plantings. In all four trials, biomass and N uptake were linearly related, meaning that as biomass increased, so did N uptake (Figure 1B). Thus, as N addition for later plantings did not increase yield, it also did not increase N uptake. Across all N rates, N uptake ranged from 36 to 78 lbs N/acre and averaged 62 lbs N/acre for the triticale planted before September 20, and ranged from 16 to 20 lbs N/acre with an average of 19 lbs N/acre for triticale planted after September 20. For every ton of DM triticale biomass produced in the fall, approximately 70 lbs of N was taken up. 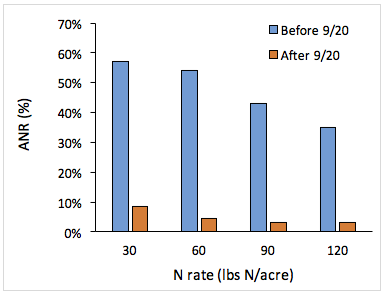 Figure 1: Above-ground fall biomass accumulation (A) and nitrogen uptake (B) of triticale at different planting dates and N rates averaged across four trials. Figure 2: Apparent nitrogen recovery (ANR) of triticale at different planting dates and fall N fertilizer rates, averaged across four trials. The apparent N recovery was greater for earlier plantings (Figure 2). This is related to increased biomass production for the earlier planting dates, which has a direct impact on N uptake capacity of the triticale. The ANR averaged 47% for triticale planted before September 20, and only 5% for triticale planted after September 20. Winter cereals, like triticale, grown as double or cover crops can take up residual N as well as additional N applied at or close to planting but the amount of N taken up depends on planting date. Triticale in this study was able to accumulate 0.9 tons DM/acre and take up 62 lbs N/acre on average when planted before September 20, but only 0.2 tons DM/acre biomass and 19 lbs/acre of N on average when it was planted after September 20. Additional N did not influence biomass or N uptake if triticale was planted late, but when planted early biomass did increase with greater N availability showing the benefits of early seeding for utilizing end-of-season N or newly applied N from manure. Planting winter cereals like triticale can sequester N that could otherwise be lost as well as provide dairy farmers with an additional opportunity to apply manure while reducing the risk of N loss. More research is needed to determine more precise planting windows for optimal N utilization by winter cereals in the Northeast, as well as determining an upper limit to the amount of manure that can be applied in the fall if a winter cover or double crop is planted. Ort, S.B., Q.M. Ketterings, K.J. Czymmek, G.S. Godwin, S.N. Swink, and S.K. Gami. 2013. Carbon and nitrogen uptake of cereal cover crops following corn silage. What’s Cropping Up? 23: 5-6. Available at: https://scs.cals.cornell.edu/extension-outreach/whats-cropping-up.